GPS time Synchronization: Power system reliability starts with precision timing. 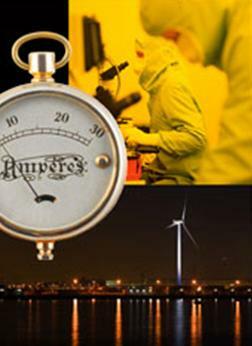 Precision timing is required for monitoring and control of electrical power networks where power system reliability is important. Circuit breaker control schemes require precise timing to ensure proper operation, and Sequence of Events Recording systems report events with one-millisecond precision to aid diagnostics and troubleshooting. Typical “critical power” applications include electric utility networks, data centres, hospitals, water treatment plants, refineries, and other process industries. A GPS antenna receives a time signal from the system of satellites orbiting the Earth. 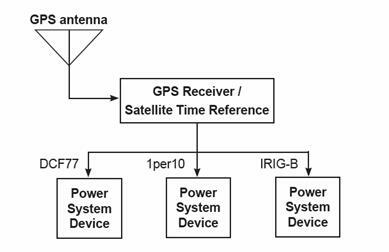 A GPS receiver accepts raw time data from the antenna and converts it to one or more time protocols. IRIG-B — time codes originally developed by the US military and widely used by electric utilities and others, especially in the United States. IRIG-B is typically distributed as a DC level shift (unmodulated IRIG-B) with 100 pulses per second. Examples of devices which implement IRIG-B include PowerLogic ION-8600 meters from Schneider Electric and SER-3200 event recorders from Cyber Sciences. Network Time Protocol is a web protocol used to provide a time reference over an Ethernet network or even the Internet. 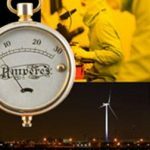 However, the accuracy that can be achieved with this approach is normally on the order of one second – not sufficient for the one-millisecond precision required in most critical power applications. A relatively new standard for precision time synchronization is defined by the IEEE in standard IEEE-1588 (also known as “Precision Time Protocol” or PTP). Using the IEEE-1588 protocol, devices can achieve sub-millisecond accuracy over an Ethernet network. However, special Ethernet hardware is required, and the protocol is not yet widely available in electrical power devices. In the future, it is likely to be implemented widely in power system, in conjunction with GPS technology. GPS time synchronization is especially useful when power system devices are located in different physical locations, such as several buildings in a campus arrangement or multiple substations separated by great distances. For more technical details on GPS system architectures and examples illustrating power system devices, please see this Technical Note . or copy this trackback: http://engineering.electrical-equipment.org/power-quality/power-system.html/trackback from your own site. Really an interesting post.Doesn’t know about such thing in power system before. yes.good idea in protection as well as energy efficiency programs.post more. good post . help me with 12kv lightining arrester sectional diagram. thanks. Your blog is excellent and very informative to me. I am happy. I found your website some what perfect for my needs. It contains wonderful and helpful. I want to get all free Industrial software & downloads . I’m a 3rd year student from University of Malaya.this info is very useful for me but can you tell me m ore about this?I’m currently doing my internship and would like to propose this matter to my manager. but I need to do some research first. GPS gives precision timing even with different receivers? I mean, if you have GPS receivers at different locations synchronizing Sepam times all the Sepams at the installation will share the same time with millisecond precision? We would like to record from time to time some data from them with remote access (GRPS) and would like to have a synchronizing method that does not require establishing connection. This is in reply to Ignacio Soler’s question of 15-June. Yes, you are exactly correct. If you have many GPS receivers in different locations, they all sync to the same satellite system, and so all Sepam relays synchronized to this system will share the same time reference to within 1 ms precision. This is true for Sepam (and other power system devices) in the same physical location or across the world in another time zone. They can all reference Universal Coordinated Time (UTC) with 1 ms resolution in time stamps. For more technical information, please visit our web site at http://www.cyber-sciences.com or email us a question at sales@cyber-sciences.com. We would love to hear from you! Current GPS technology are important branches, such as navigation and future goft the individual pursuit. We also publish technical notes on topics requested by our customers. I would be very interested to hear your questions or learn of your experiences. I look forward to hearing from you–in English, Francais or Español.